Treat dull, lack-lustre skin to the Hello FAB Ginger and Turmeric Vitamin C Jelly Mask from First Aid Beauty. 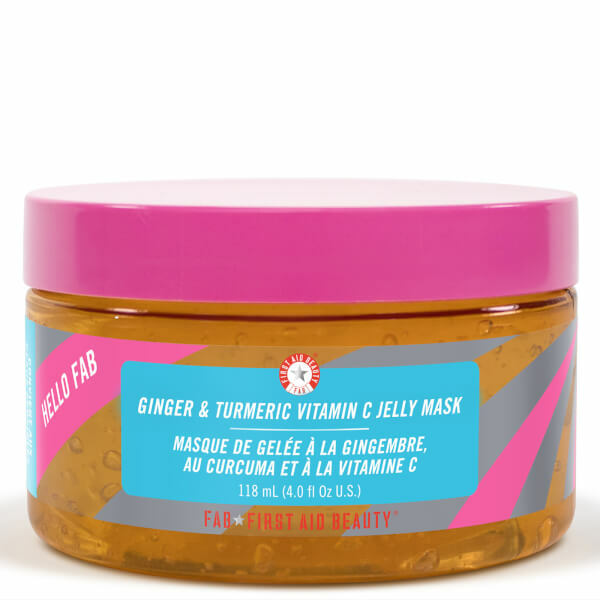 Synergising superfoods Ginger and Turmeric, the face mask revitalises and refreshes stressed skin to promote a radiant, healthy-looking complexion. Delivering long-lasting moisture and hydration, the luxurious treatment utilises skin-brightening Vitamin C to combat dullness and minimise the look of fine lines and wrinkles for a smoother, more refined visage. Expect replenished and invigorated skin with an improved overall appearance. Free from alcohol, mineral oil, parabens, phthalates and petrolatum. Apply a generous layer to clean skin, avoiding the eye area. Leave on for 10 minutes and rinse with water or remove with a soft washcloth. Use 3 times per week or as needed.